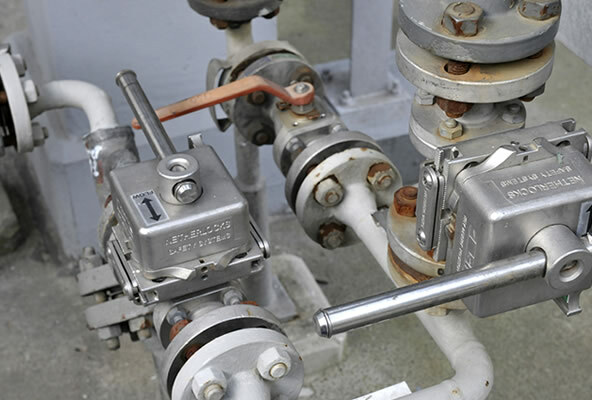 The NDL valve interlock fits any type of 90 degree valve, such as ball valves, butterfly valves and plug valves. Keys are only released in fully open or fully closed position. A new stainless steel, sliding lever replaces the original valve lever. No periodic maintenance is required. The NDL can be mounted on each size of valve, however to a maximum stem diameter of 40 mm. Above that size, a customized interlock is provided. For valves with a lever above 730 mm a gearbox is recommended. Netherlocks has eliminated nearly all rotating movements from the lock designs. Keys are inserted linearly and the internal locking mechanism consists only of linear moving components. This reduces internal wear and tear and makes the mechanism less vulnerable for dirt and and. Lubrication with grease is not required.